As the figure of a person occupying a space not of her own, the figure of the stranger appears to represent the one who does not belong (Ahmed, 2000). 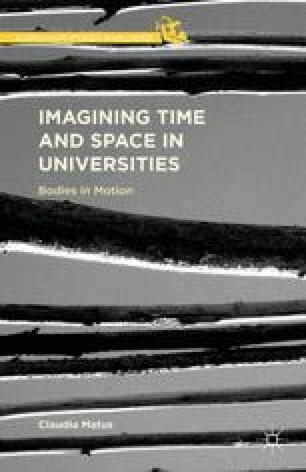 In this chapter, I explore on how ideas of the s trange body are produced in research studies and how these notions affect the ways we inhabit institutional spaces and times. To do this I explore on the discourses presented in research studies about international students and the ways they provide the contours by which to live and experience space and time. In this chapter, I present a discussion on the notion of the graduate international student as constructed by research studies in which the production of deficient subjects is a way to enforce the ideal notion of a person occupying a particular space and time in US educational institutions. Here, it is important to pay attention to the roles and operations of a disembodied identity that is produced in research studies. By disembodiment I mean the detachment of the body from the particularities of time and space (Bordo, 1986).1 As bodies in motion are represented in research as lacking and culturally deficient, the image of the subject is of someone who can be read as neutral, absolute, and detached; detached from her/his “original space” and her/his tempos.